The trip started with deciding whether to drive or fly the 1800 mile (2897 kilometers) round trip to Berkeley or not. After talking it over my wife and I decided to drive for several reasons. The drive and the hotels would have been cheaper than flying. Plus we wouldn’t have to rush to the airport or the car rental. We could also carry what we want too. We left home at about 7:30AM on November 7th. Things went pretty smoothly until we drove through Lacy, Washington. That was when the ‘CHECK ENGINE’ light came on. “Oh No! Now what! ?” I had it checked out and found that maybe one of the oxygen sensors was faulty. We decided to keep driving. After about 50 miles (80 kilometers) the light went out and everything seemed fine. Fine until we made it to southern Oregon and northern California. There we were driving through the dark night, in the heavy rain, and fog. At one point I had to slow down to about 30 MPH (50 KPH) because of poor visibility. We couldn’t see squat. It was about that time when my wife, Karen grabbed the cell phone to call Best Western in Yreka, California where we sent the night. It was nice to crawl into bed. The next morning we were on the road again. The scenery was beautiful. Instead of going straight to Berkeley, we detoured to Santa Rosa. 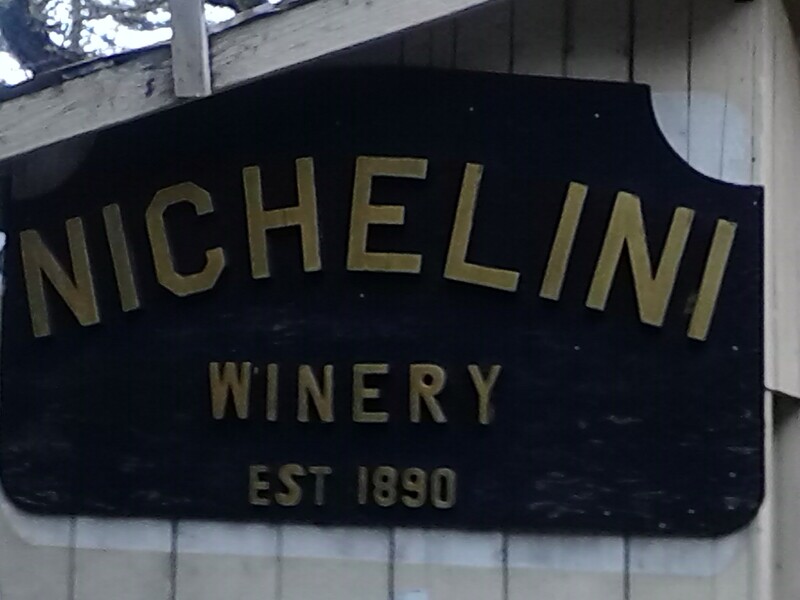 On the way we stopped at Nichelini Winery. What an enjoyable stop. After some wine tasting, Karen stayed inside and talked to the owners about whatever, and I was outside exploring. 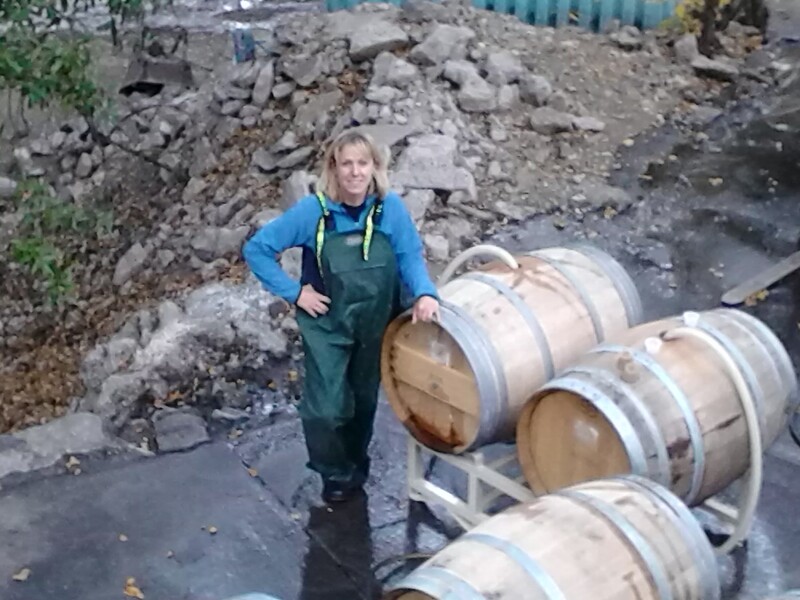 Filling the new barrels with water so the wood would hydrate and swell, so it would later hold wine. 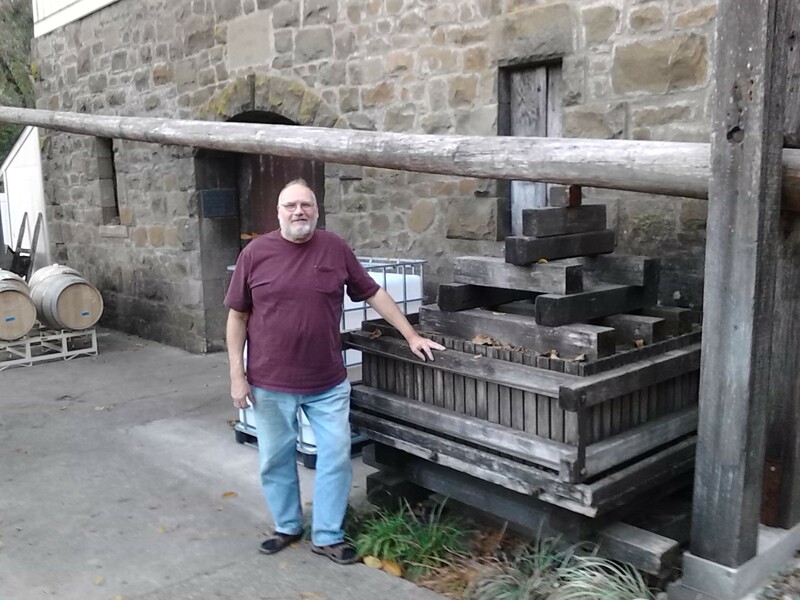 Myself by an old wine press. The pole is the lever that’s used to crush the grapes in the tank. Much like a giant garlic press. After the night in Santa Rosa we arrived in Berkeley and stayed at the Berkeley City Club. The next morning while the bride and groom and their parents were doing whatever needing to be done; I was off exploring the site. Every door that wasn’t locked, I tried. Almost. There was one small door outside going into a crawl space area that looked interesting. However if the hotel found out somehow, I’m sure they wouldn’t be too happy. And if I came out all dirty, my wife would be most displeased. The wedding was good. Simple with plenty of food before and supper after the wedding. They had beef and chicken to choose from. The reception went until about 11:00 that night. Berkeley is a nice place to visit with some good eating places. Karen and I ate at a great Cajun restaurant just a few blocks from the hotel. After a few days we took our long drive home. It was fun, but it’s good to be home again.